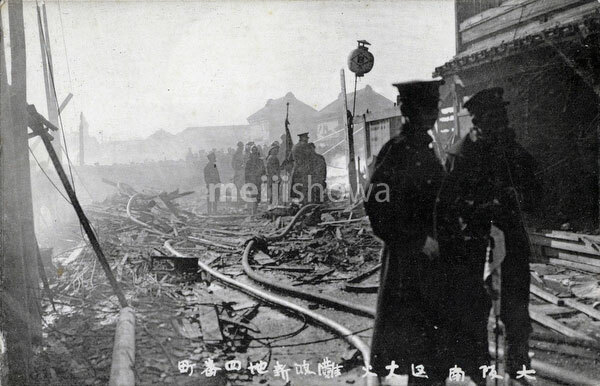 Firefighters at Namba Shinchi Yonbancho (難波新地四番町) during the Minami-ku Great Fire (南区大火, Minami-ku Taika) of January 16, 1912 (Meiji 45). Over the span of ten hours an area of about 1,5 km by 400 meters was burnt to the ground. The famous Ikutama Shrine (生国魂神社) was one of the casualties, it was completely destroyed.